Six hard-working West Virginians were honored Oct. 20 for exemplary vocational rehabilitation through the West Virginia Division of Rehabilitation Services. The annual Ability Works Awards honor one outstanding candidate from each of the agency’s six districts, coinciding with National Disability Employment Awareness Month. DRS Director Deborah Lovely presents the Ability Works award to Jeremy Smart. 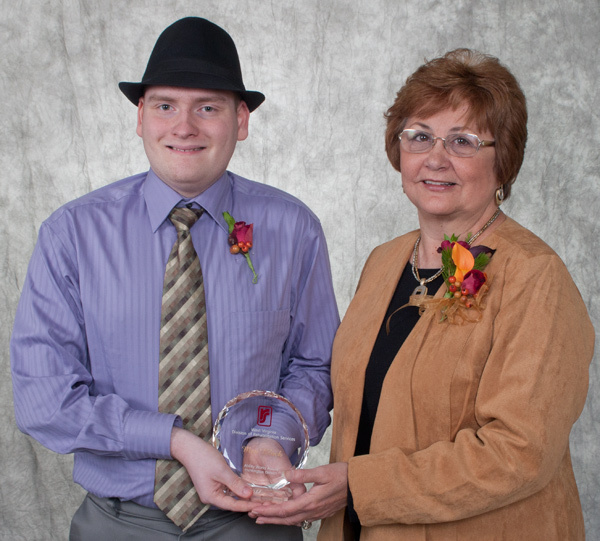 "Happy" is the word that best describes Jeremy Smart, a 23-year-old office aide at REM Community Options in Williamstown, WV and the Division of Rehabilitation Services State winner of the 2011 Ability Works Award. Jeremy has cerebral palsy, which presents him with significant physical limitations. Originally from New Zealand, Jeremy moved to West Virginia with his dad when he was in junior high school, which meant a new country, a new culture, a new school system and learning to maneuver through a new social service system for him and his family. As a student at Williamstown High School, Jeremy was referred to DRS for assistance in transitioning from high school. Karen Empfield, Jeremy’s rehabilitation counselor, worked as part of a team to help Jeremy find the services he needed to prepare for his future. Jeremy had a supportive family and with his significant physical limitations, his dad had been his primary caregiver, seeing to his daily needs. Jeremy; his parents; the school system, including his teachers, a physical therapist and an occupational therapist; various representatives from REM Community Options and Empfield recognized that a strong support system would need to be in place for Jeremy to find a job and live independently. Jeremy wanted to find help for his future. He wanted to get his own apartment and be on his own with a job. Working with REM Community Options, a Community Rehabilitation provider and partner with DRS, Jeremy applied for and was awarded a waiver which opened up additional service options for him, including transportation and assistance to meet his daily personal care needs. When discussing Jeremy's future and possible employment options, Empfield said, "Jeremy wasn't sure what he could do. He liked being around people. He liked cooking. He liked animals." Empfield secured evaluative services through REM Community Options. Community based assessment services allowed him to experiment with different job tasks in order to determine his work interests. Life skills assessment, followed by life skills development and training have helped Jeremy expand his independent living skills. Working with a job coach further helped Jeremy learn job tasks and skills he needed to live on his own. With a strong foundation in place, when a job answering phones and greeting customers at REM opened up, Jeremy applied and landed the job. Jason Lynch, area director at REM, says Jeremy is a perfect fit for the job and he gets along with his co-workers. "If his co-workers had to vote most popular co-worker, they'd vote for him because he's always happy. He's always laughing. He has a funny laugh that stands out in a crowd," said Lynch. When asked about Jeremy's future, Empfield believes "the sky is the limit for him." She sees him doing more than what he's doing now, growing in his independence and living a full life. As for Jeremy, he's comfortable where he is now. He likes where he works, he likes getting to know people and more than anything, he's happy. 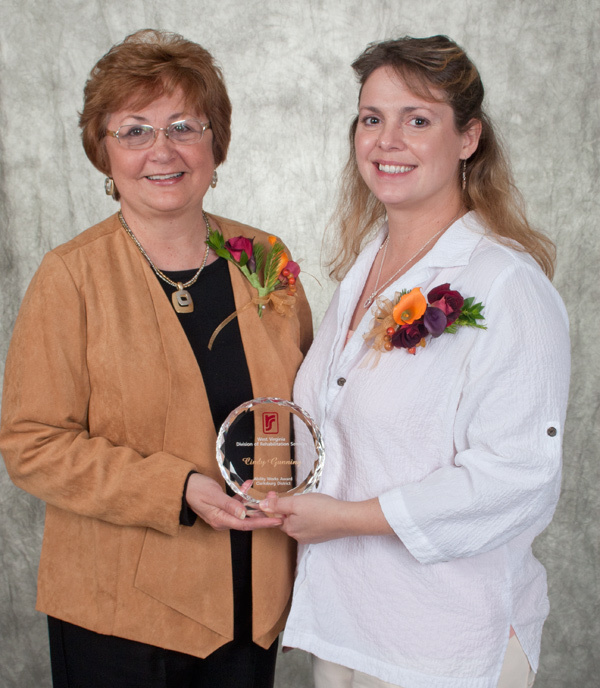 DRS Director Deborah Lovely presents the Ability Works award to Amanda Staats. When Amanda Staats graduated from high school, getting a job wasn't her top priority. But, her full-time employment doing data entry at Jackson County Development Center (JCDC), Inc. in Millwood, WV has earned the 21-year-old recognition as the 2011 Charleston District Ability Works Award winner from the Division of Rehabilitation Services. During Amanda's senior year at Ravenswood High, the school's transitions coordinator referred her to DRS. Amanda has a learning disability and she was very unsure of what she wanted to do with her future. When she first met Rich Ward, her rehabilitation counselor, she was nervous and didn't know what to expect. Ward and Amanda began talking about and planning for her future. According to Ward, Amanda lacked direction. She was very shy and had little confidence in herself and her abilities. She didn't know what kind of work she wanted to pursue or what she might be able to do well. Amanda agreed that work adjustment training from a community rehabilitation program might be beneficial in helping her research a vocational goal and develop work skills. The referral to JCDC, Inc. started Amanda on her path to employment success. Amanda's first progress report after she started work adjustment training at JCDC, indicated that her self-confidence was growing and that she was out-performing more experienced workers. Amanda's participation in life skills assessment and development services at JCDC further helped her overcome her shyness and grow her self-confidence. Her personal growth and excellent performance during her work adjustment training helped Amanda land a full-time job with JCDC. Mark Crockett, production manager, uses terms like smart, bright, reliable and intelligent to describe Amanda. He also says that Amanda picked up on the work there very quickly. "Amanda has unlimited potential," according to Ward. "I think she had some trouble getting started, just because she may have not had confidence in herself. Now she has that confidence. "And I think she can do whatever it is she wants to do. If she wants to continue her education, or further her education, or move up in the world of work -- advance in her career -- she can do that," says Ward. "I really think she has the ability and the confidence to do that." When asked what she likes most about working, Amanda says, "I really like making new friends and talking to people." Amanda has made great strides since graduating from high school, when she was so unsure about her future. Now, she is most proud of working at JCDC and living on her own. DRS Director Deborah Lovely presents the Ability Works award to Cindy Gunning. Confronting death brought Cindy Gunning back to life. The 37-year-old Elkins resident and teacher is the Division of Rehabilitation Services 2011 Clarksburg District Ability Works Award recipient. Cindy was diagnosed with metastatic small cell anaplastic carcinoma, a form of lung cancer, in 2002. Treatment has been effective and her cancer is in remission. Her life now is full of promise. She works as a substitute teacher for Randolph County Schools, hoping one day to be accepted as a full-time teacher. That's a hope she didn't have a few short years ago when she was diagnosed with lung cancer. "I really thought that I was going to die," Cindy explained. "Well, a year later I was still here. I love the movie 'The Shawshank Redemption,' and there is a great quote, 'Get busy living or get busy dying.' So I decided to get busy living, and the only way that I knew to do that was to go back to school and get an education." With financial assistance from the West Virginia Division of Rehabilitation Services, Cindy went back to school at Fairmont State University to get her nursing degree. Cindy zealously pursued her degree, excelling in her classes. But, somewhere along the way Cindy began to have a change of heart. She had an interest in education, but was afraid she had invested too much time and effort in the nursing field. Her vocational rehabilitation counselor encouraged her, recommending that the education field would be a great fit for her. "It was Cindy's perseverance that got her through that," said Debbie Riggie, the DRS counselor who nominated her for the award. "She was so motivated and dedicated throughout the whole process." Cindy's motivation to be something better got her to go back to school. And, it was her motivation, hard work and perseverance that enabled her to earn her bachelor's degree in education after transferring to Davis and Elkins College in Elkins. "I had the motivation to do that, at that point," Cindy said, "because I had a daughter, I wanted to live and I wanted to be successful in my life." Cindy's first attempt at college, before her cancer diagnosis, had been unsuccessful. "My biggest obstacle was me," she said. "I didn't think I could do it." "I love working with kids," she said. "I want every child I teach to enjoy school." 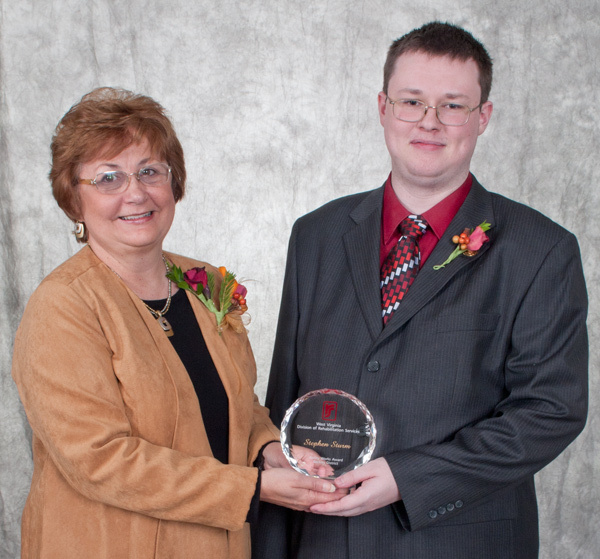 DRS Director Deborah Lovely presents the Ability Works award to Stephen Sturm. Change was always difficult for Stephen Sturm. But his willingness to change and adapt landed the 24-year-old his job as a cashier at Wal-Mart and earned him recognition as the Beckley District winner of the 2011 Ability Works Award from the Division of Rehabilitation Services. Diagnosed with autism as a child, Stephen had unique perceptions and preoccupations that resulted in unusual behavior, making life challenging for him and his family. Growing up, Stephen had an aptitude for and an interest in computers and technology. When he first came to DRS, his mind was set on being a computer technician. But, jobs in that field are limited in the White Sulphur Springs area, where Stephen lived with his supportive family. Stephen came to DRS when he was in high school, not knowing what to expect. Nancy Harris, Stephen's rehabilitation counselor, wasn't sure he had the vocational maturity to succeed in such a demanding job. According to Harris, when Stephen first came to DRS, he didn't know what to expect from the world of work. With Nancy's assistance, Stephen began working at Gateways Industries in a sheltered work environment, so that he could experience a variety of jobs. But, it was Nancy's referral to Gateways' new independent living skills assessment program where Stephen really grew and thrived. Working one-on-one with a skills trainer, Stephen made great strides toward independence and maturity. His anxiety about becoming more independent didn't stop him from growing personal competency and gaining confidence in his abilities. Stephen became more and more excited about getting a real job and he worked really hard to find one. He worked with a job developer and a DRS employment specialist, pursuing as many job leads as possible. After applying to Wal-Mart a second time, Stephen scored his first job interview. Harris is proud of Stephen's persistence and credits Wal-Mart for taking over after Stephen's experience with DRS. "They placed him in the exact right position -- in the electronics department -- where a gadget man felt right at home," said Harris. Wal-Mart was able to capitalize on Stephen's skills that he developed through his experiences with DRS and Gateways. Stephen works the night shift, a schedule he adjusted to very quickly. Starting as a night stocker, Stephen was fascinated by the store's computer equipment, cash registers and phone systems. He absorbs everything his supervisors tell him and acclimated well to his job and soon learned to operate the cash register. His love and aptitude for technology is put to much use. Stephen stocks the electronics department and learns everything he can about the products so he can answer customers' questions without hesitation. Stephen's supervisors at Wal-Mart are extremely satisfied with his work. William Basham, shift manager, lists Stephen's best qualities as being on time, being at work when he is scheduled, being a quick learner and always wanting to learn more and more. His strength as an employee is customer service. According to Basham, "he treats customers like a friend he's known all his life." Stephen may find change difficult, but his ability to change has helped him grow into a hard-working cashier who loves his job. "The one thing I'm most proud of right now is the fact that I'm able to live on my own," said Stephen. 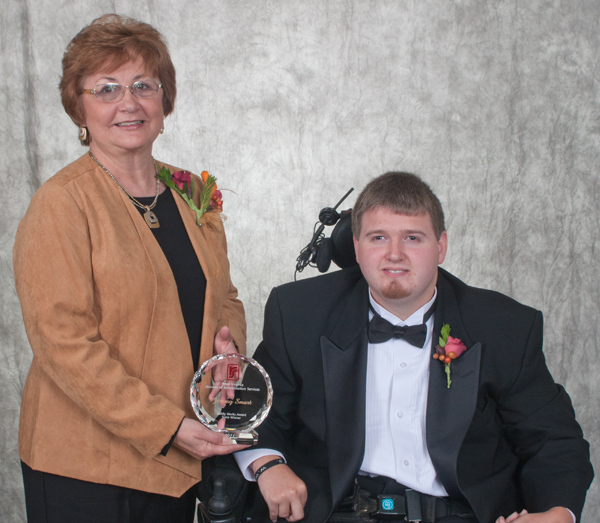 DRS Director Deborah Lovely presents the Ability Works award to Max Black. "What's next?" That's the question that Max Black needed to answer as he approached the end of his high school career. Max was anxious about his future. He felt he needed direction and he didn't believe his high school classes had prepared him for college. Max has Asperger's syndrome, and was referred to the Division of Rehabilitation Services when he was attending Huntington High School. Max lives with his grandfather and he depends on him for support and reassurance. According to Debbie Spencer, Max's rehabilitation counselor, "His grandfather has been very concerned about Max's future. He was very interested in having Max open a case with us so that he could have a job and have an income and learn to be more self-sufficient and independent." Max did well in school, especially with his involvement with the JROTC program. Through this experience, Max was used to taking direction and following instruction. These were skills that Spencer believed could be assets to him and a potential employer. But, Max still needed direction and guidance about possible job options. He had no real work experience. Spencer, Max and his grandfather agreed that work adjustment training, where Max could experience a variety of job tasks, would benefit Max as he tried to determine a work goal. Max enjoyed his training experiences provided by Goodwill Industries of Huntington. Max described his experience in the recycling plant as "unique." After his work adjustment training, Max felt he was ready for a real job. Landing the job at Walgreens in Huntington has earned Max recognition as the 2011 Huntington District Ability Works Award winner from DRS. According to Spencer, "When he came here, his work ethic was outstanding. He had a real enthusiasm to come to work." Alice Spague, Walgreens store manager, has positive things to say about Max. "Max is a wonderful person. He has a great personality. "He keeps us on our toes," says Sprague. "That's his best thing. He helps unload our trucks on our two truck days and he's back there encouraging us, getting us motivated, keeping us working faster." Twenty-year-old Max really likes his job as service clerk. His approach to being a good employee is to do the jobs they want him to do. When someone shows Max what to do, he does it, no questions asked. Max recalls feeling insecure before he got this job. "My biggest fear was me doubting myself." But, Max has a message for those students approaching high school graduation. "If you feel like you got a good challenge in front of you, just go for it. Don't wimp out. Just go for it." 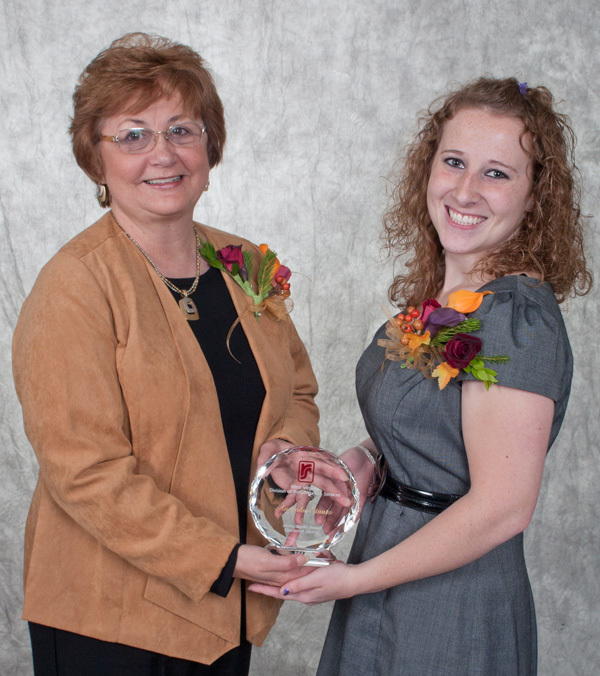 DRS Director Deborah Lovely presents the Ability Works award to Nichole Ellifritz. As a high school student, Nichole Ellifritz knew that she wanted to find a job after she graduated, but she was completely unaware of what she wanted to do. Nichole has a cognitive disability and was referred to the Division of Rehabilitation Services by Keyser High School when she was a junior. Nichole's only real work experience up to this point was some babysitting and some cooking and cafeteria experience through her Pro-Start cooking class at her vocational school. She liked these experiences, but wasn't sure what kind of jobs might be available to her. Nichole's mother was supportive of her and encouraged her to work with DRS. Nichole began discussing employment options and job skill requirements with her vocational counselor. She was sure of one thing and that was that she was not interested in a job that required reading or math on a regular basis. She liked 'hands-on' types of work and she was most comfortable with a lot of supervision and guidance. Nichole worked with her rehabilitation counselor throughout her junior and senior years of high school. As they continually discussed job options, Nichole's interest was piqued when her counselor told her about an on-the-job training program in janitorial work at Developmental Center and Workshop in Keyser. If she chose to participate in this program, it would likely lead to a job, if it was something she was interested in pursuing on a more permanent basis. Nichole excitedly agreed to the on-the-job training opportunity and began working with Developmental Center and Workshop not long after she graduated from high school. 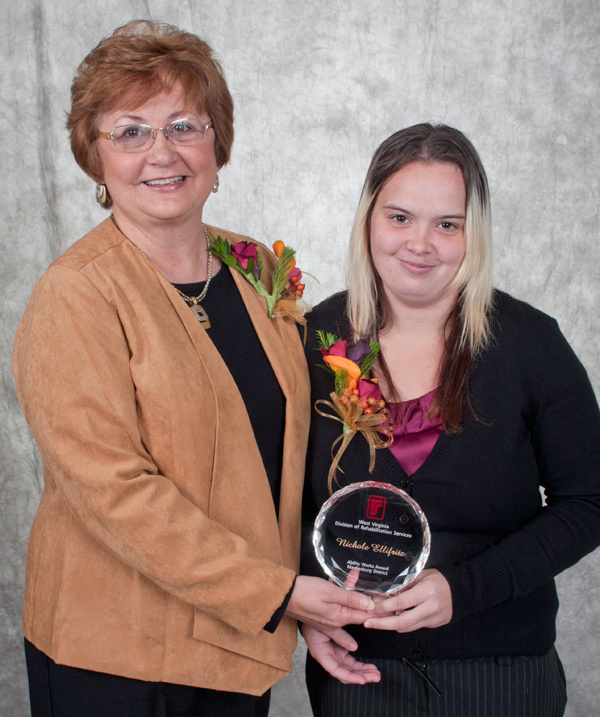 The experience was a success for Nichole and her work accomplishments have earned the 21-year-old from Keyser recognition as the 2011 Martinsburg District winner of the Ability Works Award from DRS. Victoria Brooks, Janitorial Coordinator/Rehabilitation Supervisor at Developmental Center and Workshop, says that Nichole wanted to do janitorial work when she began her training and feels she caught on very fast. Sherry Faulk, Nichole's rehabilitation counselor believes Nichole was just looking for something that she would be good at and comfortable with when she came to DRS. "She wanted to find somewhere she'd fit in and could work forever if she wanted to," says Faulk. "Nichole fits in with everyone," according to Brooks. "She gets along with all her peers." Faulk speaks highly of Nichole. "She's a good worker and a good example of what rehab counselors like to do," Faulk explained. "She was interested in the process. She was always thankful for the help and she followed through on what she said she'd do and what we said we'd do and it made a good team." Nichole likes her job at Developmental Center and Workshop. The thing she enjoys most about her job is working with people. She was happy with the training she received and is grateful to all those who helped her pursue the job opportunity. "I work with good people," Nichole stated. "I like my job."